Nothing smells better than a fresh, hot batch of gooey cinnamon rolls. Whether you're entertaining a house full of people for the holidays, pampering your family on a Saturday morning, or simply treating yourself to a much-needed sugar rush, these home-baked goodies are sure to delight. Making any sort of homemade bread can be intimidating, but it doesn't have to be a difficult process. Even if you find yourself having to knead dough by hand, there are ways to make the task easier and more enjoyable. While it might leave your arms a bit sore, the results are well worth the workout. Combine the warm water and the milk in the bowl of a standing mixer or a regular bowl if you don't have a standing mixer. Sprinkle the yeast on top of the liquid mixture. Let it set on top and get foamy before sprinkling the sugar on top of the yeast. Stir in the first 2 cups of flour. Once the flour is fully incorporated into the wet mixture, begin to add about a 1/4 cup at a time. If you don't have a standing mixer, then turn the dough onto a lightly floured surface and begin to knead the remaining flour in once the mixture is too thick to stir. The dough should be kneaded until it is soft and smooshy. Yes, smooshy. This should take about 6 minutes in the standing mixer and 10-12 minutes by hand. Once the dough is kneaded, shape it into a ball and place it in a lightly greased bowl. Sprinkle the top of the dough ball with flour, cover the bowl with a clean towel, and then place the bowl in a draft free area for an hour (until dough is doubled in size). After your dough has risen, turn it out onto a lightly floured surface. Begin to roll the dough into a 16-inch by 7-inch rectangle. Evenly coat the buttered dough with the brown sugar and cinnamon. Spread it out with your hands if you need to, and feel free to add more of either ingredient according to your taste preferences. Set the remaining butter aside, and begin rolling your dough up, going lengthwise from one end to the other. Don't roll the dough too tightly, or else it won't have room to expand during the proof or in the oven. Once you've rolled your dough, use a sharp knife (I used a serrated bread-loaf knife) to cut a roll out every inch or so. Butter the bottom of two 8-9" round pans/pie dishes or you could use a cookie sheet. Give your rolls some room to grow when you place them in the baking pans, about a half-inch or so. Let the rolls proof uncovered for about 45 minutes. Bake the cinnamon rolls in the oven at 350° F for 20-25 minutes. While the cinnamon rolls are cooking, go ahead and work on the glaze. Mix all of the glaze ingredients together. Add more milk if the glaze seems too dry, or more sugar if it's too wet. Once the cinnamon rolls are finished baking, remove them from the oven and set them aside to cool for a few minutes. 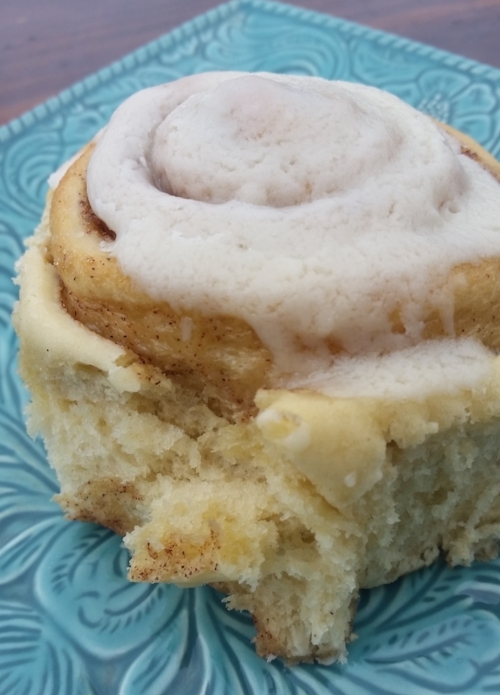 After your cinnamon rolls are smothered in gooey sweetness, serve them up and enjoy!